LinkedIn sent a notice titled "Important updates to the LinkedIn Developers program and APIs" to account holders that have setup API integrations. This would include any administrators that have setup LinkedIn login integrations for the Cirrus Gateway. 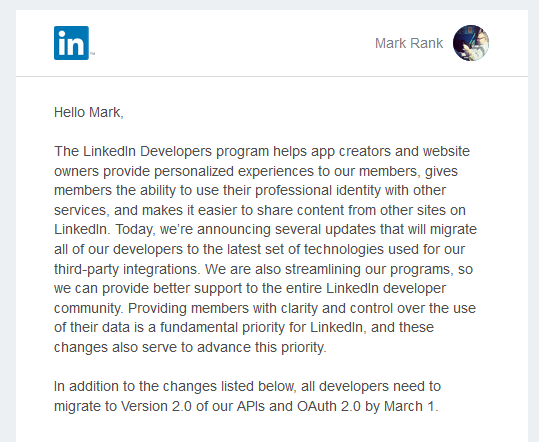 The notice from LinkedIn is informing you that V2 version of the API used for LinkedIn login needs to be used by March 1, 2019. Cirrus Identity needs to complete some work that is scheduled for January 2019 before this change can take place. At this time (December 17, 2018), there is nothing for customers to do. As Cirrus Identity completes the work to upgrade our use of the LinkedIn APIs, we will communicate additional details as needed. Customers of Cirrus Identity may contact support@cirrusidentity.com with specific questions or concerns.